UREC introduced a high-end residential kitchen in the fall of 2016 (located on the first floor of UREC), featuring an induction cooktop, convection microwave oven, and commercial refrigerator and freezer. 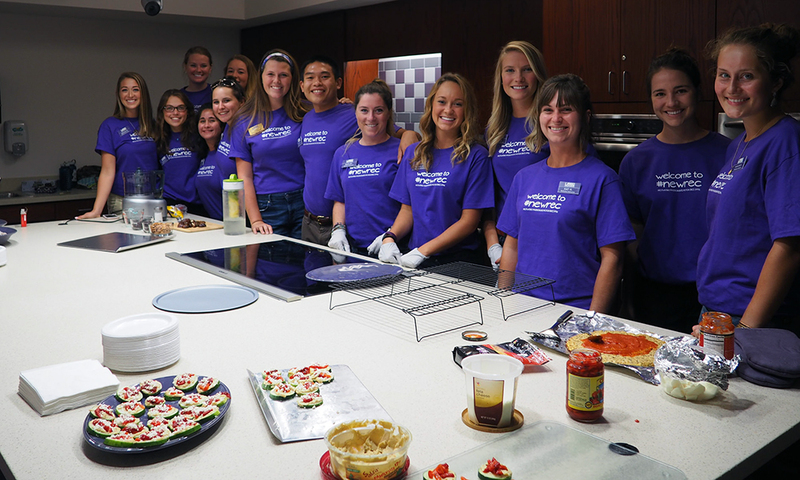 Since then, over 100 cooking and baking programs have been offered to JMU students and the UREC staff is excited to expand these offerings in the coming semesters! Holly Bailey, assistant director for fitness and wellness, reflects on this new addition saying, “We knew that we had the staff and felt this would help in promoting overall wellness to our community.” Programs are facilitated by UREC student employees, mainly upper-class dietetics and health science majors, which is an incredible opportunity for them to apply their studies outside the classroom and make a positive impact on their peers. Bailey also shared that, in planning the demonstration kitchen programs, she anticipated a general student interest in nutrition, and has been proved right time and time again over the course of the year. The wellness assistants that work as instructors reiterated this observation as well. Not only are they particularly passionate about what they teach, but they have recognized a genuine interest from participants and get excited when they see returners. “We want to give [participants] confidence,” they explained, “and the skills to make good meals in their own dorms or apartments. We want them to know that anyone can cook quality food at home and do it on a budget!” A returner even chimed in that she makes the chicken salad recipe she learned how to make in a demonstration class on a weekly basis. Classes seat up to forty people, although some may be as small as nine. No matter the size, all are inclusive and interesting! Although instructors try to design interactive opportunities, it’s important to note that classes are meant to be demonstrations. Due to the limited time allotted, instructors do their best to show participants how to make a dish, but participants won’t necessarily get to test out their skills for themselves. However, you can definitely look forward to a taste of the finished product!